Compact design for use on small medical aluminum and composite oxygen cylinders (home health care applications). Chamber designed for easy operation. Stainless steel stem design for dependable service and long life. 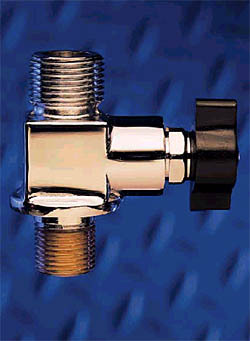 Durable lower plug made of tough naval brass resists wear. Lower plug is Teflon® -coated to add lubricity, which minimizes seizing and galling especially under high pressure operation. Internal bonnet gasket seal resists damage to chamber sealing area. Single unit, compact pressure relief device incorporates 165° F fusible metal backing to resist premature rupture and provide maximum cylinder protection. Chrome plated for corrosion resistance and cosmetic appeal. Oxygen cleaned with aqueous detergent to CGA specification G4.1.